Myanmar has asked Beijing for co-operation to help prevent "terrorists" from using Chinese territory to launch cross-border attacks. Martial law has been declared in north-east Myanmar after heavy fighting between the military and ethnic-minority rebels. Army chiefs have accused "foreign powers" of supporting the insurgents. The Chinese government denies backing the rebels and has called for a peaceful resolution to the fighting. On Thursday, Hmuu Zaw, an official from the office of Myanmar President Thein Sein, published a statement on Facebook which alluded to cross-border attacks. He said: "It is necessary to co-operate…on the understanding that terrorist attacks on Myanmar are not allowed from Chinese territory." Chinese officials were not available to comment on the statement, reported the Reuters news agency. Sporadic clashes continued in the north-eastern Kokang region on Thursday, though they were not as intense as in recent days. Since 9 February the military has been battling the National Democratic Alliance Army (MNDAA), a group aiming to achieve autonomy for Kokang. At least 50 government soldiers and 26 rebels have been killed in the fighting. Tens of thousands of refugees have also been forced to flee their homes. Chinese state media said there had been 30,000 border crossings by Myanmar nationals over the past week. Kokang is dominated by ethnic Han Chinese, and the MNDAA says it is seeking autonomy for residents in the region. The recent fighting was triggered by the return of the group's leader after five years of exile in China. Officials in Myanmar said martial law had been declared in Kokang to "restore peace and tranquillity", with the army being given executive and judicial powers. 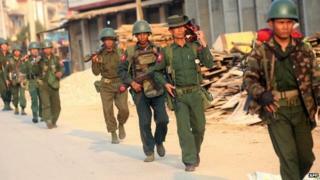 Since it gained independence in 1948, Myanmar has struggled to contain several ethnic rebel insurgencies.